What are Dolphins Saying? New Research May Shed Light – FIREPAW, Inc.
Dr. Denise Herzing has been studying Atlantic spotted dolphins, Stenella frontalis, in the Bahamas for over three decades. 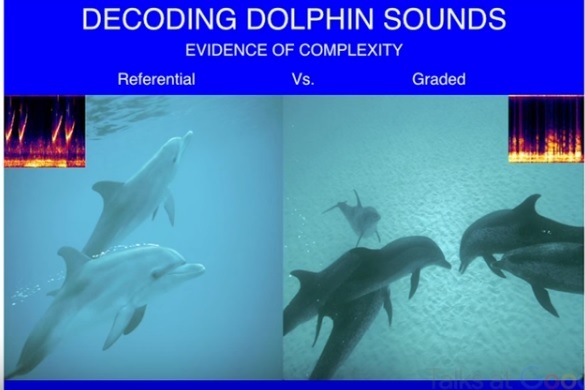 Her video and acoustic database encompasses a myriad of complex vocalizations and dolphin behavior. Dr. Thad Starner works on mining this dataset and decoding dolphin sounds, and has created a wearable underwater computer, CHAT (Cetacean Hearing and Telemetry), to help establish a bridge for communication between humans and dolphins. In this video Starner and Herzing present this cutting-edge work and recent results, including perspectives on the challenges of studying this aquatic society, and decoding their communication signals using the latest technology.